BAYLEE 2018 Topps WWE UNDISPUTED Auto PLUS EXTRA!!!! - SASHA BANKS! Yu-Gi-Oh! 3x Cosmic Cyclone (German) - SDCL-DE029- Common - 1st Edition NM! x3 Pumpkin Carriage - BLRR-EN005 - Ultra Rare - 1st Edition Yu-Gi-Oh! 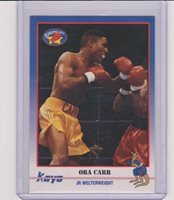 (100) 1991 KAYO OBA CARR BOXING CARDS #28 ~ DETROIT MI ~ HUGE LOT!! !